This dish turned out SO good. A definite winner that will be repeated in our house! I found it in my 2010 Taste of Home Annual Recipes cookbook. It was delicious! Hubby loved it, too! 1 pound sliced fresh mushrooms (we don't normally eat mushrooms, but still wanted it for the flavor; i only used about 1/2 a pound). Cook the pasta according to package directions. Meanwhile, in a dutch oven, cook diced sausage over medium heat until no longer pink; drain & set aside. In the same dutch oven, saute mushrooms & onions in oil until tender. Add garlic & oregano; cook one minute longer. Stir in 1 cup of the wine (or beef broth). Bring to a boil; cook until liquid is reduced by half. 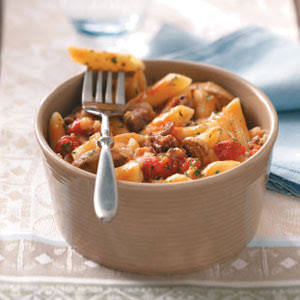 Stir in tomatoes, tomato sauce, broth, sausage & remaning wine/broth. Bring to a boil. Reduce heat; cover & simmer for 15 minutes. Cover & bake at 350 for 25 minutes. Uncover; bake 5-10 minutes longer or until bubbly & the cheese is melted. Sprinkle with minced parsley if desired. (This is how i did mine; even with the 1 dish).